Although increasingly encouraged to incorporate digital media into classrooms to prepare students for engaged participation in a digital world, teachers are often taken by surprise when paradigm clashes arise between traditional school expectations and the affordances of these new spaces. Through data gathered from ethnographic methodologies during a rich teacher-researcher partnership, this research foregrounds tangles that emerged when a high school English teacher and a partnering researcher adopted new media tools and pedagogies in two traditional English classes. They concluded that each tangle found its genesis in two competing urges teachers experience when engaging in pedagogical design: the desire to maintain traditional English class norms and the desire to reshape and reimagine it. This collision of strategies and tactics emerged in five distinct categories: vantage points, genres, boundaries, tasks, and expectations. These results indicate a need for greater awareness of the difficulties in the maintenance of new classroom spaces; attention to the complex negotiations required when teachers juggle technological knowledge, pedagogical knowledge, and content knowledge; and the need for teacher education to create more space for future teachers to work with these tensions through reflection upon collaborative pedagogical design practices in authentic classroom environments. The unpredictability of pedagogical design resonates loudly when digital media collides with official classroom spaces (Jewitt, 2006). This digital, or new, media is more than just a collection of digital or screen-based devices or platforms; rather, it encompasses a conglomeration of shifting tools, practices, norms, and expectations that help create particular kinds of spaces, activities, and ways of being (Jenkins, 2006; Leander, 2007; Moje, 2009) in the English classroom. Tensions are present when classroom teachers take aim to integrate digital media pedagogies and tools into English curricula (Collins & Halverson, 2009; Leander, 2007; Warschauer & Ware, 2008; Zhang, 2009), whether planning for students’ utilization of smart phones (Ehret & Hollet, 2014), multimodal forms of writing and production (Bruce, 2009), or blogging and social networking (Leland, Ociepka, & Kuonen, 2012). Jewitt’s (2006) notion is especially resonant when looking at the integration of digital media with pedagogy, since educators’ use of technology foregrounds design, requiring teachers to think about “how to configure the class and how to reconfigure themselves as teachers” (p. 159). The process can sometimes result in generative disruption of tradition but can also result in a mere transposition of tools, rather than of paradigms, pedagogies or dispositions. While the introduction of media is by no means the only tension-inducing phenomenon in pedagogy decisions, new technologies make more visible (Boyd, 2014) the existing complexities, social inequities and competing frameworks that complicate teacher decision-making. In this study, I examined the constant creative grappling that a teacher engaged in when incorporating digital media into her pedagogical plans. Engaging students in a critical use of digital tools requires that educators avoid unfairly reappropriating their affordances for merely traditional purposes (Benson, 2010). Planning also requires considerations of limited commodities (such as time, money, and technology) in an already over-stuffed English curriculum (Bruce, 2009). In other words, teacher planning occurs in a swirling ecology of teachers and students, old and new media, the “what is” and the “what could be” (Damico & Rust, 2010, p. 104). Unsurprisingly, the entire enterprise can be dizzying. The ethnographic study described in this paper examined a rich teacher-researcher partnership in order to zoom in on the so-called tangles (Nespor, 1997) that were made visible when a practicing high school English teacher and I (a partnering researcher-participant) explored what happened during the course of one semester. We incorporated a wide variety of new digital tools and pedagogies into two traditional English classes: English 10 Honors and American Literature. The findings located each tangle’s genesis at an interplay of strategies (moves to preserve the present-day status-quo of English class, as defined by traditionally accepted authoritative elements in education, such as curriculum, standards, and policy-makers; De Certeau, 1984) and tactics (moves to reshape and reimagine what English class might become by working around or manipulating traditionally accepted norms; De Certeau, 1984). Our work together highlights the practical realities and challenges – which I framed as tangles – that emerged when a teacher works to integrate digital media (and new paradigms) into a traditional classroom. By highlighting the resulting tangles, I argue for greater awareness of the difficulties in the maintenance of new classroom spaces, as well as the need for teacher education to create more spaces for future teachers to work with these tensions through collaborative pedagogical design practices in authentic classroom environments. When teaching with technology, English teachers encounter both macro- and micro-level tangles. Macro-level tangles manifest at the level of the institution, system, or community and include barriers toward technology integration, such as lack of administrative or collegial support or an all-consuming focus on state assessments (Ertmer, Ottenbreit-Leftwich, Sadik, Sendurur, & Sendurur, 2012). More micro-level tangles emerge at the site of the day-to-day personal teacher decision-making around teaching and learning with technology. Young and Bush (2004) suggested a framework for English language arts teachers working through these highly localized plans: develop a pedagogical framework, ask important questions, establish working guidelines, implement these strategies while integrating technology, and reflect on the experience. They suggested that careful attention to these nuanced details will carve out critical, informed uses of technology in classroom spaces that foreground learning and dispositions. 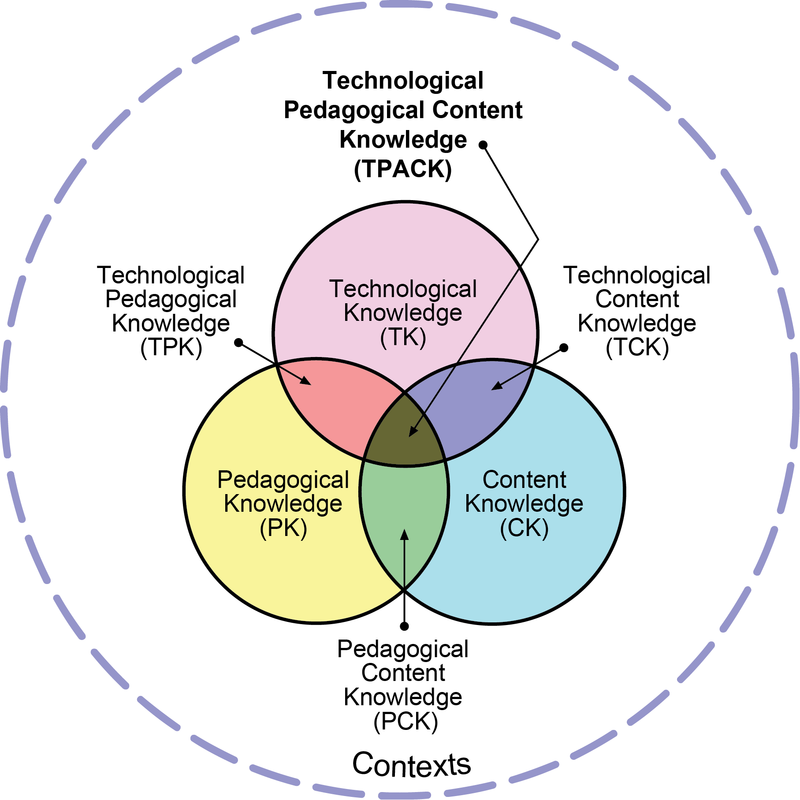 Mishra and Koehler (2006) added greater conceptual density to Young and Bush’s work with their description of technological pedagogical content knowledge (later termed technology, pedagogy, content knowledge, or TPACK), which emphasized the complexity of the three separate but interrelated fields of content, pedagogy and technology. By acknowledging the incredibly “dynamic, ill-structured” environment in a classroom as well as the nuanced, nonneutral characteristics of the technologies utilized in these spaces (p. 1025), Mishra and Koehler advocated for teacher reflection at the levels of pedagogical content knowledge (PCK), technological content knowledge (TCK), and technological pedagogical knowledge (TPK; see Figure 1). This “complex web of relationships” (p. 1044) between PCK, TCK and TPK calls for an approach in teacher education and professional development that these scholars coined “learning technology by design” (p. 1020). This approach involves engaging current and future professionals in authentic technology design problems (e.g., redesigning an educational website, creating idea-based videos, or designing an online course) to “help teachers develop the deep understanding needed to apply knowledge in the complex domains of real world practice” (p. 1034). Leander and Sheehy (2004) recognized the complex nature of pedagogical decisions when they pointed out that “classrooms are realized not only with brick and mortar, but also with institutional documents, student sketches, curriculum plans, and the ways in which persons and the state are co-constructed in teacher discourse, among others” (p. 3). Words and activities surrounding pedagogical design inscribe particular discourses, “distinctive ways of speaking/listening so as to enact specific socially recognizable identities” (Gee, 2011, p. 37). In the context of pedagogical design, discourses summon specific “ways of coordinating and getting coordinated by other people, things, tools, technologies, symbol systems, places, and times” (Gee, 2011, p. 40). Discourses coalesce to shape figured worlds (Gee, 2011) around what counts as learning, as school, and as English class. For the purposes of this paper, I refer to these commonly accepted figured worlds as traditional approaches to teaching English. They revolve around expected and commonplace English language arts (ELA) content (e.g., canonized works of literature, literary devices, and proper Modern Language Association citation style), as well as expected and commonplace ELA practices around that content (e.g., reading and writing texts, Initiation-Response-Evaluation patterns in discourse, and whole-class discussion). These expectations are entirely culturally constructed, of course. Practices that are expected and commonplace in one context or in one mind may be entirely different in another. The entrance of new tools or ways of doing things can create a jarring sense of disequilibrium when they fail to mesh with existing conceptions of the purposes and practices of schooling. When faced with the threat of change or destabilization, agents in power often resist shifting in favor of sustaining and reproducing traditional, socially established norms and practices by implementing what De Certeau (1984) called strategies. Strategies originate from subjects with power to create and produce socially established places and norms. In classrooms, they often emerge at a nexus of teacher, curricula, standards, and test expectations. A teacher may create a handout to formalize traditional expectations or devise an incentive system to promote compliance with established norms. Tactics, on the other hand, are usually initiated by those who are not in power in a situation (De Certeau, 1984). They creatively shift space through clever manipulation, remaking, or repurposing. For example, in classrooms, tactics might emerge as students creatively create backchannels or counterscripts (Guttierez, Rymes, & Larson, 1995) to teachers’ official scripts by using classroom time, space, materials, and assignments to fulfill their often more-social purposes. With the constant back and forth between strategies and tactics in classroom spaces, researchers are naturally drawn to questions around “how the meaning of schooling gets contested, negotiated, and re-invented across multiple, loosely connected streams of practice” (Nespor, 1997, p. xii). Nespor introduced tangles as an analytic construct to make sense of the complex intersections and interconnections among people, tools, policies, politics, and practices in schooling. Strategies and tactics shape teachers’ movements through and around encountered tangles, which can often emerge at the collision of two clashing discourses or two contrasting urges: the desire to maintain traditional power flows (in the form of strategies) and the desire to work around the established authority to reassert a newly imagined English class space (in the form of tactics). For example, a first year teacher may enter the field with the tactical commitment to create an ELA classroom that focuses on authentic projects around social justice. However, she may also simultaneously enact strategies that work against this reimagined classroom space because of her desire to fit in with her colleagues and impress her principal with high standardized test scores. Her two contrasting urges might create tangles in her pedagogical design process. What tensions emerge when a classroom teacher and a collaborating researcher integrate digital media tools and pedagogies into a traditional English class curricula? How and why do these tensions emerge? The Teacher. Allison, the practicing high school English teacher and the focal participant in the study, was at the time of this study in her sixth year teaching English at Glen View High School (participant and school names are pseudonyms). Allison was dedicated to teaching the traditional canon of English literature in student-centered ways. She incorporated popular culture references and video clips into class conversations about literary texts and appeared especially skilled at scaffolding reading comprehension for students through read-alouds, pausing, and questioning. As just one of several American Literature teachers in the same school-endorsed professional learning community, Allison worked hard to remain on the same curricular page as the other teachers. While she felt complete freedom with how she taught (and the tools used for student learning), she felt bound to remain consistent with the content she taught, which she generally saw as the canonized works of literature. The Partnership. Allison and I first met in October 2011, when I broadly proposed that we partner to “see what happens” when digital media enters traditional classroom spaces. We then coplanned and cotaught two of her classes (American Literature and English 10 Honors) the following spring semester, integrating digital media at multiple turns. We used a Ning site (featuring space for forums, blogs, status updates, and photos) as a class virtual learning platform, engaged both classes in multimodal compositions, and tried out other tools, such as PollEverywhere, Twitter, Pinterest, and Critical Web Reader. As a participant-observer, I gained access to the students and Allison’s teaching decisions and reflections in a way that I would not have been able to had I been a more detached researcher in the back of the room. By virtue of the fact that we were coteaching, Allison and I constantly exchanged emails and frank comments about next steps in projects or how to deal with a certain issue or particular student’s needs. A case study framework enabled me to narrow my focus on the phenomenon of digital -media-integrated pedagogical design, and I utilized thick description, long-term participatory observation and close examination of my own positionality (Merriam, 1998). Data sources specifically included extensive field notes taken during class (73 single-spaced pages); all rubrics, calendars, handouts, and final grades; all email communication between Allison and me (143 in total); audio-recorded interviews/planning sessions with Allison (33 sessions for a total of 671 minutes); audio-recorded class sessions (28 of each class); and all teacher comments and contributions on the online Ning site. In an iterative, emergent, inductive coding cycle (Saldana, 2009), I thematically labeled each teacher planning decision that surfaced in the data, for example, “setting deadlines,” “making assignment authentic,” “giving student choices.” During this phase I still met regularly with Allison to engage in member check in order to make sure I was answerable to the critical critiques of my teacher partner, pushing me to continually articulate the “relevancy of academic research to classroom practice” (Stevens, 2011, p. 194). As I collapsed categories, I began to notice that many of my codes, such as “promote play” and “keep students focused from distraction,” were potentially oppositional, and thus, created some sort of dilemma (Lampert, 1985) or tangle to manage. These became my analytical focus, because each tangle stopped us in our tracks, just as a good hair tangle stops the motion of a brush. I then moved to work on my second research question: How or why did these tangles arise in the first place? I looked at my oppositional, tangle-creating codes (such as “freedom” versus “structure”) and determined whether each code served more as a tactic or strategy. Determining whether each teacher move or rationale served to “preserve old classroom norms” (the role of strategies) or pushed us to “reimagine new classroom norms” (a tactic’s purpose) crystallized my findings. The cases I chose to share in my findings sections arise as the most representative tangles that appeared and recurred during our semester of intentional classroom reform. Using tangles as an analytical construct enabled me to focus my eyes on intersections and tracing “flows rather than states, focusing on networks and the layered connections that knot them together rather than on simple linear histories of circumscribed events or settings” (Nespor, 1997, p. xiv). My findings comprise a series of tangles that caused generative moments of pause between Allison and me in our planning discussions, moments when we viscerally experienced tension between seemingly divergent expectations and purposes around what English class currently is or should become. A triangulation of the various data sources revealed a recurrent pattern: As we pushed ourselves to implement change and carve out space to reflect on the decision-making that occurred at every turn, we increasingly found ourselves stopped in our tracks by tangles encountered in our pedagogical design. A closer analytic look at these tangles revealed their genesis at the intersection of potential teacher strategies (which helped us maintain the status quo of English class) and teacher tactics (which helped us rethink “what could be” in the context of English class). Strategies emerged in the data when we felt the pull to legitimate the work we were doing as academically rigorous in a traditional sense. These strategies often originated from the official curriculum, the institutional place of the school, an understanding of the proper English class canon, or standards and from implicit beliefs about what should count as learning in official school assessment measures. On other occasions, when interviews and emails detail the struggle to make our ideal vision of best practices fit in the constraints presented in the classroom, when we had less control over the institutional spaces within which we worked, our pedagogical decision-making revolved around tactics that helped us reimagine and resist dominant narratives about schooling and literacies of power. When the strategic desire to conform to traditional English class expectations collided with the tactical desire to transform Allison’s English class, tangles were the inevitable result. In the following section is a description of each major recurring tangle that we worked to unravel during our collaborative pedagogical design process with digital media: vantage points, genres, boundaries, tasks, and expectations. (See Table 1 for a summary of theoretically informed findings.) The findings elucidate the discursive dance between strategies and tactics that teachers constantly enact as pedagogical designers attempting to navigate the very complicated macro and micro realities of teaching English in high school. In their description of an ideal teacher-researcher partnership, Bisplinghoff and Allen (1998) wrote, “At its best, teaching and research feel so balanced that each supports the other, like the seesaw partner at the playground who has only to move a little up or back to achieve that searched-for stillness, no feet touching” (p. 5). Mostly due to Allison’s generosity, keen intellect, and honest communication, our work together came the closest to this dynamic that I have ever experienced. Minor tangles were inevitable, however, as we coconstructed new media learning spaces from distinct vantage points, perspectives with embedded histories, interests, and frames. Many of these tangles can be attributed to our divergent purposes with the project of implementing digital media: Her natural interests as the teacher in the class revolved around improving teaching and learning; mine as the researcher pushed me to discover interesting new things to contribute to the field. Her concerns around the new projects and approaches we codesigned tended to be logistical, practical, and managerial. Her most immediate field of relations included teacher lounges, overseeing administrators, test scores, parent emails, the onslaught of papers to grade, and fairly distributing her time across all of the classes she taught. Although only a few years removed from a context similar to Allison’s, my setting at the time of the study was remarkably distinct. I would go directly from her classroom to graduate school classes with academic scholars and graduate students discussing large-scale education reform and theoretical frameworks that were fraught with the discomfort of education’s role in managing the bodies and movement of young people. Our most common pedagogical tangles interpersonally arose at the intersection of these two different identities or discourses. Our distinct socially situated identities – the English teacher and the graduate student researcher – presented a separate “who-doing-what” (Gee, 2011, p. 30). Not surprisingly, I generally pushed for more tactical pedagogical design, as I had nothing to lose and everything to gain from radical paradigm shifts in the class. Allison, however, had more to gain from maintaining many of the traditional trappings of the English classroom and more typically utilized strategies in pedagogical design. Julie: One option is to give them options so we could say – some might be really into taking photos and others might want to actually do a petition to try to change something, or we could have them all do photos and talk about elements. Allison: I’m kind of inclined to just give them something they have to do because my worry is…I’m hesitant because I don’t want to discredit them. My worry is they won’t do the photo project because, if we say they have options, they’ll procrastinate and not do the photo project and then at the last moment they’ll just write a sloppy letter…You know what I mean? Julie: Cameron was like, “I’m going to do a documentary! I’m going to video each people.” Like he had all of these ideas. I’m not sure if he’s going to follow through, but then if I make him do photos, will that limit him? Allison: Probably not. I don’t think he’ll care. And it will help him have structure with all of his ideas. . . In this instance, my suggestions were tactical because they suggested giving students full ownership over how they represented their ideas, a paradigm unusual in a typical ELA high school classroom. Allison’s suggestions to more rigidly scaffold and structure the assignment were strategic in nature because they reified existing discourses about students needing strict guidance and deadlines. In no way was my position in this conversation more correct than Allison’s. Pedagogical design is fraught with tension between structure and freedom, a tangle I will explore in more depth later in this article. This very tension is an aspect Mishra and Koehler’s (2006) TPACK model, which its wide-open, intersecting circles, fails to connote. In our interaction, Allison spoke from a position almost completely prescribed by pedagogical knowledge. Her concerns were around students’ absence of motivation, procrastination, or lacking structure to complete a task. My words, however, remained largely limited to technological knowledge, as I grappled with the range of technologies that students could potentially leverage in this assignment. While the two positionalities can (and did) inform each other, it is also accurate to say that they existed in uneasy contention. Allison: So [adding technology to pedagogy] was easier to do when you were there. Julie: I wish everyone had two coteachers. Julie: Well, you can’t! There’s so much going on! In other words, we both missed our tangled collaboration. In many ways, I functioned as the introducer of tactics into the classroom, simply because K-12 teachers have little time to reflect and reimagine. (I certainly did not have the time to do this satisfactorily when I was a K-12 teacher.) Allison, on the other hand, functioned as the agent that kept us grounded and realistic. Either of us could, and sometimes did, take on the other’s predominant role: Allison as reenvisioner and me as reality-checker. it was by virtue of the tangle of our different purposes and vantage points, however, that transformation could take root. Upon deciding to replace a traditional journal assignment about Anna Karenina with a series of mandatory blogs for the English 10 Honors class, we went about the challenging task of crafting a handout that would capture our dual (potentially contradictory) hopes for this assignment: doing rigorous literary analysis and getting authentic experience with the blogging genre. Although formal literary analysis complete with citations and textual evidence was privileged as a powerful discourse in the classroom, the more conversational and potentially multimodal blog medium was an unfamiliar addition. Allison and I were forced to confront Jewitt’s (2008) question as it pertained to the ELA classroom: “What kinds of artifacts, modes, and literacy are legitimated in different spaces, and what is enabled to flow and move across these spaces?” (p. 262). Create an entire blog inspired by a compelling idea, thought, or question that surfaced in one of your classmates’ blogs. What does your classmate write that you find interesting, insightful, significant, and how can you expand their ideas or take them in a different, nuanced direction. This is a typical convention of the blog genre. Bloggers will link to a past blog or fellow blogger and will write their own reaction. You need to have something substantive here to add to the conversation. This is a larger endeavor than just a comment posted at the end of someone’s blog. Citations from the text to illustrate the blogger’s claims. Multimedia (pictures, videos, sound) that enhance the meaning. An engaging voice (humor is commonly used, but not required). Connections between the text and pop culture or personal life. An invitation for further conversation about your thoughts. The blog handout (Appendix A), clearly indicates that our preferred product from students would involve literary content written in a blog style. In other words, we utilized a potentially clashing combination of strategies (asking for traditional literary content) and tactics (asking for a reimagined, informal style) to create a new product. A closer look at the rubric used to grade the blogs (Appendix B), however, reveals an emphasis on traditional style, including immaculate editing, MLA parenthetical citations/works cited, and traditional conceptions of intellectual property. I know when we designed it we had a lot of conversations about making it feel like a blog and not a thing that they do – although they are doing this thing for class. And so it’s this tension between these two things. And what I did notice and I don’t know…how much it matters, but there were only a few people who consistently used quotes; in fact, a lot of them didn’t at all. I know it’s hard for me because it’s like the thing with the blog; it kind of gives up the academic-ness of what it was before, and that was hard for me as a teacher. I get why it needs to happen for a blog, why you want it to have this authentic feel, but I also wanted them to delve deeply into analysis, and the blog didn’t encourage that as much as, “Here’s some really strict parameters about how I’m making you delve into the text.” And so there’s a conflict with that, and I think some of them could cop out more because they could kind of copy each other. Notably, the tangle caused some discomfort, especially with Allison who, as the classroom teacher, had more to lose (in terms of preparation of her students for the AP test and potential questions from colleagues, administrators, and parents) if the traditional academic side of the assignment for the honors students was sacrificed. Yet, this very discomfort productively pushed Allison to take a clearer stance on the type of meaning-making spaces she hoped to carve out for students. The tangle also took place squarely in the center of the technological pedagogical content knowledge identified by Mishra and Koehler’s (2006) TPACK model. Allison and I were clearly working through questions about what is afforded by technology paradigms, what kinds of parameters, handouts, and requirements might be the best pedagogical moves for students, and how to push students to rigorous and engaged content analysis of the literature. The three different foci did not work in perfect concert; rather, they were discernably out of tune with each other. This tangle illuminated the possibility that when classroom teachers bring, for instance, social media into the classroom, multiple interaction norms and participation expectations may be simultaneously at work. Students and teachers have to determine if they should use formal essay-like trappings of the academic genre or more informal, participatory, remixed stylistic markers of social media genre. This situation reveals the ways in which classroom spaces exist in “hierarchical and dialogical relations with other spaces” and are never completely discrete or isolated from one another, “complex, contested, and alive with problematics” (Moje, 2004, p. 18). Bringing a new media tool into a classroom may not be merely a simple switch; rather, it may have rippling effects. In order to house student blogs, status updates, photos, and forum posts, Allison and I created a private, Facebook-like, class social networking environment using the platform Ning (http://www.ning.com). Layering a new virtual classroom atop an existing physical classroom, though exciting, resulted in a stress-inducing workload. For Allison, it resulted in preparing forum questions well in advance of when she normally would and being inundated with blog and forum posts to comment on and moderate. For her students, it resulted in having to cultivate both a virtual and physical classroom presence, with the added pressure of now having an audience for their informal writing/posting. Allison: Yeah. And even this idea they probably don’t notice, they look and see I commented at 6 o’ clock at night, and this idea that all I’m doing is stuff for them all the time…I didn’t want to perpetuate that. For Allison, the logistical affordances of the new media tool (such as the ability to connect with students effectively both inside and outside of school) also presented one of its largest constraints: the lack of boundaries around time, privacy, and space. Her wrestling was squarely at the intersection of technology (“Now I can be available 24/7!”) and pedagogy (“How available should I be to my students?”) and, thus, situated in the technological pedagogical knowledge sphere (Mishra & Koehler, 2006). Although connectedness was a desired tactic wrapped up in the Ning adoption decision, a sense of intrusion on personal time was unsettling, eroding an important strategy of self-preservation or separation. Interestingly, Allison ended up negotiating her inability to control students’ perception of her teacher self on the Ning space by largely disengaging from participation after school hours. Right, which is actually why I was wondering if and maybe it’s just me being stuck in this. I’m really concerned about them reading and tweeting. They are reading and also being expected to tweet. They probably could do it, but maybe it’s just me on this “that sounds distracting idea.” So that’s why I was wondering if there was an audio version of it so maybe they could listen and tweet…So no one was reading. But then I think to myself what happens, then will they check out and become so consumed with the tweeting? Various binaries marked Allison’s qualified concerns. Listening to an audio version of the play is framed as an inherently less demanding task than reading aloud. Tweeting is seen as a potential distraction from the real work of text comprehension. These frames of pedagogical understanding are not only steeped in deep ideologies and histories of which literacies count and what English class is really for; they also come from years of experience of working with teenagers. We decided to go on with the experiment of letting them multitask, reading the play aloud while tweeting in character. Julie: It was really interesting to watch them tweet when we read versus watched the movie and, in general, it felt like it worked better while they watched the movie. Allison: They weren’t responsible for reading, right. Interestingly, this same scene played out when we had the English 10 Honors students compose status updates on the Ning, personally reacting to Streetcar Named Desire, both while reading the play and while watching the movie. The visual medium of video, paired with the fact that students were experiencing the plotline and characters a second time, allowed an easier flow to tweet beside. Envisioning digital media work as play and essay-writing as work unearths the assumption that digital media evokes low-level, copy-and-paste skills rather than real lasting critical engagement. It also reveals the difficulty of operating in the same mode (written words) in two spaces at the same time, as well as the more doable task of operating in two different modes (watching/hearing a movie and writing/reading status updates.) In this case, several students protested that tweeting while reading the play aloud for the first time was “distracting” them and asked if they could please just take formal notes to prepare for the exam. These tangles are not easily resolved, and there are no easy winners in terms of the teacher’s choice to act tactically or strategically. In fact, preserving the status quo of the English class while reading the play would arguably have better-served their comprehension than having them multitask by tweeting while reading the play. Allison found herself in the center of Mishra and Koehler’s (2006) conceptual framework, as she juggled her desire to use social media authentically (technological knowledge) with her desire for students to be able to focus in-depth in the moment (pedagogical knowledge) and, therefore, comprehend and absorb the play’s plot and themes (content knowledge). Not only were we enacting strategies and tactics, but students were performing them, as well, in reaction to the assignments and experiences we designed. When one student resisted the tweeting exercise in favor of formal note-taking, she intentionally chose a strategy over a tactic, exemplifying the difficulty of finding the precise balance of activities in pedagogical design that stimulate without overwhelming and inspire without overdoing. Classroom-based research on incorporating new media in the classroom often discusses the tensions inherent in the need for teachers to be flexible simultaneously while working alongside students (Curwood & Cowell, 2011; Wilhelm, 2012) while also providing direct instruction and modeling (Teng, 2012). Unsurprisingly, the search for balancing freedom with structure for meaningful classroom multimodal participation (Beach & O’Brien, 2009; Gustavson, 2008) also emerged in our planning process. Allison and I consistently vacillated between the tactic of giving students freedom by avoiding constricting their creativity while also wanting to enact the traditional English teacher strategy of providing supportive scaffolds and guidelines. Allison and I saw providing guidelines and enabling freedom as potentially convergent possibilities, although we were aware of the difficulty in presenting them this way. As we engaged with students on the design process, we often found ourselves hedging, saying, “These are some expectations [a teaching strategy], but if you have a better, more creative way of representing this, go for it [a teaching tactic]!” In general, we were surprised by the way that freedom seemed to paralyze rather than empower students, who were actively seeking norms for these new classroom spaces. Allison: And then I’m thinking if they’re staging them right…probably they should for the most part, stage them here or out there. Julie: Yeah, so that’s a question. I think that what we need to have them do is come to us…so we’re going to tell them about it on the Tuesday, and we’re going to say, “Start when you’re walking around school. Look around and start thinking about – because we aren’t going to let you go anywhere unless you are telling us exactly what you are going to do.” Because I am afraid of restricting it, because I do think there is something about space. Like, a lot of them are talking about tutorial in the auditorium so they will want a picture in the auditorium. Allison: So here’s the thing. I think they are saying, “Ok, tutorial in the auditorium is awful,” so they should take a picture of tutorial in the auditorium…. But yeah, I think they should have to tell us what they want to take and why. We realize in hindsight that during a project when we asked students to critique their school as an institution, we found ourselves using strategies to perpetuate the same types of rules and logic (e.g., “students can’t be trusted”) that drove one student to do her entire photography project around the metaphors of school as jail and teachers treating students like prisoners. We found ourselves conflicted by the intersection of our technological knowledge (which introduced new paradigms around mobility, artistic license, and the need to move freely through space) and pedagogical knowledge (calling for firm structure, expectations, and adult supervision). Nevertheless, our discussion elucidated our arrival at a sort of freedom/guideline compromise; students would be allowed some freedom to move around the school, but only in predetermined time intervals and only after they had clearly described their desired photograph and rationale ahead of time. While such constraints resonated with familiarity in school spaces, they directly clashed with the tactical spontaneous, everyday surprises that often define digital media artistic expression outside of school. The first research question asked, What tensions emerge when a classroom teacher and a collaborating researcher integrate digital media tools and pedagogies into a traditional English class curricula? The findings distilled the countless minor and major tangles we encountered throughout the semester into five distinct categories: vantage points, genres, boundaries, tasks, and expectations. The frequency with which Allison and I encountered these tangles reveals that, although frameworks like TPACK (Mishra & Koehler, 2006) are helpful in unpacking the complexity of the decisions to be made, they do not easily resolve questions of what teacher moves would best serve all of the combinations of teacher knowledge around technology, pedagogy, and content. For example, our decision to have students compose literary blogs in class was a compromise, one that sacrificed authenticity around what we knew about technology (e.g., blogs are informal and interest-driven) in order to avoid sacrificing the genre norms that we held as important in our content domain (e.g., cite the literary text we are requiring you to blog about in an academic way). Understanding that pedagogical design contends with the complex intersections between technology, content, and pedagogy is useful, but it is equally important to realize that, at times, these interlocking layers may lead teachers toward divergent pedagogical plans creating disequilibrium (or tangles) rather than the one clear, best teaching move. The second research question pushed more fine-grained analysis: How and why do these tensions emerge? Data pointed to the fact that tangles emerged at the intersection of two, often irreconcilable, urges: to preserve the regular classroom space (a strategy) and to reinvent it (a tactic). The tangle of strategies and tactics that emerged included researcher-versus-teacher vantage points, formal-versus-informal genres, preserved-versus-erased professional boundaries, multitasking versus singular focus, freedom versus structure, and competition versus collaboration. Teachers are often portrayed as strategy enactors, authority figures who benefit from maintaining traditional flows of power among social actors and literacy practices. The data illuminated, however, that we were far from merely strategy enactors. Our negotiations of these various pulls often involved the tactical type of “makeshift creativity of groups or individuals already caught in the nets of discipline” (De Certeau, 1984, p. xiv). We often made quick changes based on the opportunities we could seize within the structures and institutional norms we felt we were powerless to change. In comparison to the ways teachers are commonly portrayed in the literature as clean, uninhibited tour guides from academic objective to student learning (Day, 2010; Kremer & Sanders, 2012), this pattern of creative pedagogical redesign sheds new light on the messier paths that teachers travel when incorporating digital media into classroom spaces. Teacher educators can do a better job at making visible this complexity by resisting the urge to reduce the host of planning decisions by teachers into a step-by-step formula or lesson plan template. In critiquing the popularity of content-neutral teaching-with-technology classes so often required for preservice teachers, Mishra and Koehler (2006) asserted that such one-size-fits-all approaches which assume that “knowing a technology automatically leads to good teaching with technology” (p. 1031) are flawed due to the accelerating rate of technological change, the imperfections in software design, the situated nature of learning, and the “emphasis on what, not how” (p. 1032). The TPACK framework they described is one attempt to illustrate the complex dance of bodies of knowledge that play in teacher decision making. They proposed that high-quality teacher education integrating technology into practice should be firmly located in design practices that push preservice teachers to consider teaching not as “collections of isolated pedagogical elements” but as a “coherent system” (p. 1034). If prospective teachers are given authentic, engaging problems around technology-driven tasks (such as constructing a webpage in their content area, making digital videos, or redesigning an online class), they are more likely to become practitioners, rather than only learning about practice (Brown & Duguid, 1991, as cited in Mishra & Koehler, 2006, p. 1035). While Mishra and Koehler’s (2006) TPACK framework importantly emphasizes the various interrelating foci that master teachers navigate when thinking through tool and pedagogy decisions, it does little to address the fact that the best pedagogy, content, and technology knowledge is a socially mediated construct that does not remain constant. Thus, teachers can be taken by surprise by tensions that emerge when good pedagogy foregrounds one choice, but good content or good technology foregrounds another. This study contributes to a deeper understanding of the framework by displaying that when practically enacted, TPACK is buzzing with tension, with competing foregrounded goals and paradigms. Mishra and Koehler (2006) argued that successful teaching practice is “located in the interplay between theory and practice, between constraints and tradeoffs, between designer and materials, and between designer and audience” (p. 1035). This study zooms in on these messy interplays, and preservice teachers should spend much of their time examining these difficult spaces, laying a foundation for navigating terrain that is not always predictable or smooth. In addition, Mishra and Koehler (2006) located their web of decision-making generally in the individual head of each teacher. Our teacher-researcher partnership revealed the richness of TPACK when experienced in dialogue. The only reason so many tangles emerged in such explicit clarity in this study is because of the emails and the spoken conversation that erupted due to the inherently collaborative nature of our decision-making that semester. In this era of professional learning communities and cross-pollination of ideas, space must be made for decision-making frameworks that incorporate more than one actor. There is perhaps no greater opportunity for such cooperative meaning-making than in cohorts of preservice teachers. Teacher educators should leverage these communities of practice in classrooms by designing authentic, collaborative planning and decision-making projects and networks. All of this talk around making space for wrestling with teaching tensions resonates with the widely touted notion of cultivating a reflective practitioner (Schön, 1983), a teacher who pushes first to understand an experience situated in relation to self and context and then to reimagine for a better future (Ryan, 2013). In this sense, deep reflection is empowering: “Critical, transformative reflection suggests that an alternative reality can be recast in which the student or professional can take an intellectual stance in dealing with critical issues and practices, and is empowered to initiate change (Giroux 1988)” (Ryan, 2013, p. 2). Each time Allison and I asked ourselves the question, “How did that go?” and, “What does this mean for tomorrow?” we opened up the floodgates for tangles about vantage points, genres, boundaries, tasks, and motivations. If a teacher is working alone, however, such reflection can take the form of a teaching journal, an action research project, or a presentation to colleagues. Either way, teachers who have space (time, energy, resources, and professional development communities) to investigate the plan after the fact are far better equipped to more fully understand the tensions undergirding the decisions they have made and to resolve them productively, accept them, and move forward. Part of our work in teacher education, thus, must be to cultivate these reflective practices in the widest range of modes and media possible. Allison and I found that our deepest reflection spaces were, interestingly, triggered in the tangles. Surprised by unanticipated consequences or nagged by contradictory urges, these pause-inducing spaces then opened up a space for Allison and me to reflect. While reflection at times resulted in confusion, frustration, or giving up on an idea we had initially been excited about, it also demanded attention, promoted dialogue, and, perhaps most exciting, helped to forge the way for change. In order to have something of worth to reflect upon, preservice teachers should be doing more than simply reading about success stories using these approaches. They should be “learning by design” (Mishra & Koehler, 2006) by trying out digital media approaches with young people and then being mentored through the various tensions and frustrations that will occur. This study unearths tangles that are particular to ELA classrooms teaching with technology, such as the clash between informal technology-mediated genres and what are considered more academic genres. Preservice ELA teachers should be given opportunities to work collaboratively through these constraints and affordances with authentic tasks such as, “How would YOU grade this blog?” Such an activity pushes them to a tangle that they may not have envisioned: the desire to embrace a new platform while simultaneously assessing with old platforms, such as grades or rubrics. Another tangle described in the findings of this study involved competing urges to allow students to multitask (to keep them engaged) versus asking them to focus on one task (to ensure undivided attention). Preservice teachers might create two versions of one lesson plan: one involving multitasking with technology and the other demanding focus with technology. Then, they might try out the lesson plan by microteaching to their cohort and reflecting as a group as to which approach proved most effective. Unfortunately, the current educational climate often calls for integration of technology without the necessary space for reflection. Teacher educators, therefore, must create opportunities for future and current teachers to practice collaborative, TPACK-oriented reflection. Reflection works best in dialogue with another educator or collaborator (Baird, 1992; Nicholson & Bond, 2003), such as in the teacher-researcher partnership so central to this study. Teachers gain clarity when they intentionally reflect, not just broadly on what happened, but specifically on the repercussions of the teaching choices made in relation to technology, pedagogy, and content. These findings also illustrate, however, that these TPACK categories are not comprehensive. When learning to integrate new media into the classroom, teacher candidates are most certainly juggling pedagogy, content, and technology. The framework fails, however, to elucidate the host of complicating factors influencing those three main categories: outside community, school context, access, equity, out-of-school networks and affinity spaces, to name a few. Preservice teachers who propose bringing Twitter into the classroom need practice probing the mismatched expectations and objectives that might result. Otherwise, teacher educators risk sending out teachers who expect a sort of automatic, grand convergence when they hand students an open social network with one hand and a rubric marking off standards with the other. This work pushes the boundaries of similar research about digital media in the classroom, because it is concerned with the everyday realities that teachers and students negotiate when digital media is added to the mix of official curricular demands in schools spaces. Teachers must be better equipped to employ, not only strategies but tactics as they navigate the competing demands from various spaces and stakeholders. Teacher educators can begin this important work before teachers even enter the field by deliberately cultivating collaborative, reflective practices in preservice teachers as they engage in active pedagogical design for authentic environments. Baird, J. R. (1992). Collaborative reflection, systematic enquiry, better teaching. Teachers and Teaching: From Classroom to Reflection, 33-48. Beach, R., & O’Brien, D. (2008). Teaching popular-culture texts in the classroom. In J. Coieo, M. Knobel, C. Lankshear, & D. Leu (Eds.) Handbook of research on new literacies (pp. 33-65). New York, NY: Routledge. Bisplinghoff, B. S., & Allen, J. (1998). Engaging Teachers: Creating teaching and researching relationships. Portsmouth, NH: Heinemann. Boyd, D. (2014). It’s complicated: The social lives of networked teens. New Haven, CT: Yale University Press. Bruce, D. (2009). Writing with visual images: Examining the video composition processes of high school students. Research in the Teaching of English, 34(4), 426-450. Collins, A., & Halverson, R. (2009). Rethinking education in the age of technology: The digital revolution and the schools. New York, NY: Teachers College Press. Csikszentmihalyi, M. (1996). Creativity: Flow and the psychology of discovery and invention. New York, NY: Harper Collins. Curwood, J., & Cowell, L. H. (2011). iPoetry: Creating space for new literacies in the English curriculum. Journal of Adolescent & Adult Literacy, 55(2), 110-120. Damico, J., & Rust, J. (2010). Dwelling in the spaces between” What Is” and” What Could Be”: The view from a university-based content literacy course at semester’s end. Journal of Language and Literacy Education, 6(2), 103-110.
practices and felt experiences moving with digital, mobile devices in school. Research in the Teaching of English, 48(4), 428-452. Gee, J. P. (2011). An introduction to discourse analysis theory and method (3rd Ed.). New York, NY: Routledge. Gustavson, L. (2008). Influencing pedagogy through the creative practices of youth. In M.L. Hill & L. Vasudevan (Eds. ), Media, learning, and sites of possibility (pp. 81-114). New York, NY: Peter Lang. Gutierrez, K., Rymes, B., & Larson, J. (1995). Script, counterscript, and underlife in the classroom: James Brown versus Brown v. Board of Education. Harvard Educational Review, 65(3), 445-472. Jenkins, H. (2006). Convergence culture. New York, NY: New York University Press. Jewitt, C. (2006). Technology, literacy, and learning: A multimodal approach. New York, NY: Routledge. Jewitt, C. (2008). Multimodality and literacy in school classrooms. Review of Research in Education, 32, 241–267. doi:10.3102/0091732X07310586. Khan, M. I. (2015). Impediments to reflection in teacher education: A UK case. FWU Journal of Social Sciences, 9(2), 22. Knobel, M., & Lankshear, C. (2008). Remix: The art and craft of endless hybridization. Journal of Adolescent & Adult Literacy, 52(1), 22-33. Kremer, N., & Sanders, H. (2012, May). Shakespeare in 3D: Bringing the bard to life through new (old) media. Voices from the Middle, 14(9), 57-64. Lampert, M. (1985). How do teachers manage to teach? Perspectives on problems in practice. Harvard Educational Review, 55, 178-194. Leander, K. (2007). “You won’t be needing your laptops today”: Wired bodies in the wireless classroom. In M. Knobel &C. Lankshear (Eds. ), A new literacies sampler (pp. 25-48). New York, NY: Peter Lang. Leander, K.M., & Sheehy, M. (2004). Introduction. In Leander, K.M., & Sheehy, M. (Eds. ), Spatializing literacy research and practice (pp 1-13). New York, NY: Peter Lang. Leland, C., Ociepka, A., & Kuonen, K. (May 2012). Finding our way: Eighth graders explore social networking sites. Voices from the Middle, 19(4), 28-34. Moje, E.B. (2004). Powerful spaces: Tracing the out-of-school literacy spaces of Latino/a youth. In Leander, K.M. & Sheehy, M. (Eds. ), Spatializing literacy research and practice (pp 15-38). New York, NY: Peter Lang. Moje, E. B. (2009). Standpoints: A call for new research on new and multi-literacies. Research in the Teaching of English, 43(4), 348-362. Nespor, J. (1997). Tangled up in school. Mahwah, NJ: Lawrence Erlbaum Associates. Saldana, J. (2009). An introduction to codes and coding. The coding manual for qualitative researchers. London: SAGE. Nicholson, S. A., & Bond, N. (2003). Collaborative reflection and professional community building: An analysis of preservice teachers’ use of an electronic discussion board. Journal of Technology and Teacher Education, 11(2), 259-280. Ryan, M. (2013). The pedagogical balancing act: Teaching reflection in higher education. Teaching in Higher Education, 18(2), 144-155. Saldana, J. (2009). An introduction to codes and coding. The coding manual for qualitative researchers. London, UK: Sage. Schön, D. 1983. The reflective practitioner. San Francisco, CA: Jossey‐Bass. Stevens, L. (2011). Locating the role of the critical discourse analyst. In R. Rogers (Ed. ), An introduction to critical discourse analysis in education (2nd ed . ; pp. 183-202). New York, NY, Routledge. Teng, A. (May 2012). Writing teachers should comment on Facebook walls. Voices from the Middle, 19(4), 34-39. Warschauer, M., & Ware, P. (2008). Learning, change, and power: Competing frames of technology and literacy. In J. Coieo, M. Knobel, C. Lankshear, & D. Leu (Eds.). Handbook of research on new literacies (pp. 215-240). New York, NY: Routledge. Wilhelm, J. (May 2012). Our compulsory goals: Effective teaching and meaningful learning through powerful cultural tools. Voices from the Middle, 14(9), 81-84. Zhang, J. (2009). Toward a creative social web for learners and teachers. Educational Researcher, 38(4), 274-279. Blogs are created for all kinds of purposes. There are cooking blogs, sporting blogs, fashion blogs, parenting blogs, music blogs, news blogs, political blogs, and even academic blogs. Blogs are usually born from personal investment or passion in a theme or topic. Your blogs over this novel, however, are not simply intrinsically motivated. Despite this, your goal is to write blogs that get at the heart of the novel using humor, personal connections, informal voice, links to other resources, images, videos, etc, etc. Keep your audience (your classmates) in mind, and feel free to use pop culture references that would resonate with your peers. Discuss a theme you see being developed in the novel. What does Tolstoy seem to be trying to say (his claim) about this theme? What imagery displays this theme? Remember, a good blog will discuss theme without being predictably boring or academic sounding. You might begin illustrating the theme with a short anecdote about something that happened to you the other day. Then go on to relate the theme to the novel. You could enhance the imagery displaying the theme with actual images posted on your blog. Discuss a conflict in the book. What is the conflict? Which characters are involved? What are the sides? Are there even sides? Do you predict that this will develop into a significant conflict within the larger novel? Why or why not? Remember all conflicts fall under one of the following types: character vs. character; character vs. external force (nature, society, spiritual) ; character vs. self. Which is being developed here? Also remember that conflict is what moves a plot along. How is this conflict working to drive the story? Conflict always makes for an interesting read, so this would make a great blog prompt. Again, how do these conflicts relate to a larger contemporary conflict, news story, personal experience, etc? And how can you seamlessly tie together the textual analysis with the “big” picture? Discuss a significant event in the book. What makes it seem significant to you? What do you think about how Tolstoy relates the event? What descriptions do you notice? What draws your attention to them? Our lives and our cultural landscape are marked by significant events, so this will be easy to adapt into an informal blog form. Discuss a character in the book. How would you analyze this character? What seem to be the character’s defining traits? What are his/her relationships with other characters? Is the character a protagonist or antagonist? Are they a foil to any other character? Is he or she flat (remains essentially unchanged and tends to be more of a type than an individual) or round (changes throughout the novel and is more of an individual and complex)? Does the character remind you of any characters from other novels, movies, TV shows, etc. you have seen or read? Does the character remind you of your Aunt, distant cousin, best friend . . . or even yourself? Blog about it. Create an entire blog inspired by a compelling idea, thought, or question that surfaced in one of your classmates’ blogs. What does your classmate write that you find interesting, insightful, significant, and how can you expand their ideas or take them in a different, nuanced direction This is a typical convention of the blog genre. Bloggers will link to a past blog or fellow blogger and will write their own reaction. You need to have something substantive here to add to the conversation. This is a larger endeavor than just a comment posted at the end of someone’s blog. The questions with each prompt are designed to prompt your thinking. Your blog should not simply be a listing of answers to each question, but a well-developed paragraph or two that works to understand, interpret and respond to the novel. You may end up answering all the questions or you may answer none. You also need to make sure you post comments on at least five classmates’ blogs for each book. (You are encouraged to go beyond this minimum requirement. You should be at least skimming everyone’s blogs and then commenting on things that interest you.) Strong response posts may . . .
Go beyond just saying “good job” or “I disagree”; get specific about areas of excellence or flaws in logic. Ask the blogger questions to better clarify their main points. Address one of the comments to the blog rather than the blog itself. Each entry is clearly labeled with the title of the text and includes page numbers if necessary. Each quote in entry has parenthetical citation using MLA format. Commonplace Book includes a “works cited” page in the back.